One year ago, we proposed on these pages that Maine’s congressional delegation take bipartisan action on climate change. This would continue Maine’s long history as a leader in shaping environmental policy. Under the sponsorship of Sen. Edmund Muskie and Republican Sen. Howard Baker, both the Clean Air Act (1970) and the Clean Water Act (1972) passed Congress with overwhelming bipartisan support. In 1987 and in 1990, Sen. George Mitchell significantly improved air and water quality laws. Maine’s national and state leaders — Muskie, Mitchell, Bill Cohen, Olympia Snowe, Susan Collins, Angus King, Harry Richardson, Joe Brennan, Horace Hildreth, Ken Curtis, Jon Lund, and Jock McKernan, among others — distinctively dug in and mastered the facts of the environmental issues they tackled. They saw Maine as especially vulnerable to environmeferntal hazards. Our tourists, loggers, farmers, and fishermen all depend on the pristine integrity of our climate. Coal smoke, auto exhaust, sulfur and ozone drift over Maine on prevailing winds from cities to our west. Our forests, lakes, rivers and saltwater coasts have been prominent victims of acid rain and septic discharge. 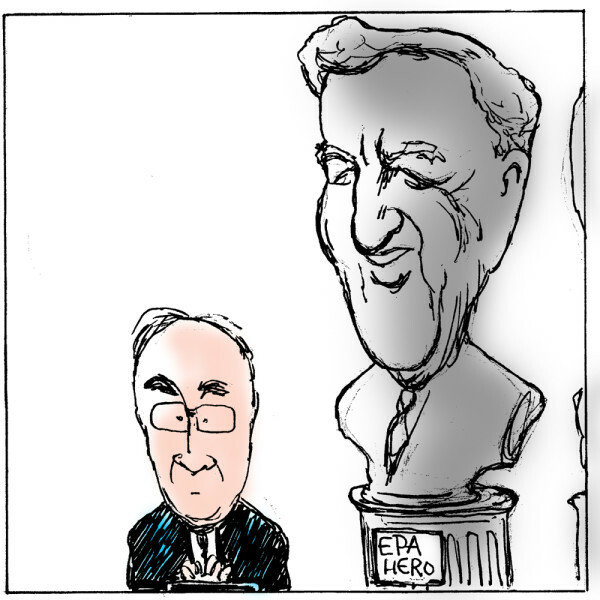 How fitting that our successful political leaders should become environmental heroes. While battles of the past are hardly over, the engagement has shifted to a new and broader front: climate change. Maine is once again in the gunsights of the threat. Lobsters hate warm water. Coastal homes — from Pine Point to Kittery — can be flooded by a slight rise in sea level. Our lumber forests, spruce and fir, are cold-weather trees. Ski resorts die without snow. Clams don’t grow shells in acid water. “ Maine’s Climate Future,” by the University of Maine Climate Change Institute (2009) and updated in a recent lecture by Professor Ivan Fernandez: Among other findings, the incidence of extreme precipitation events in Maine is often twice as high as in the past, particularly along Maine’s heavily populated coastal regions. Although oil and gas are cheap right now, Maine enjoys less comparative benefit from recent price drops. Because we are at the end of the supply line for fossil fuels, they will always be more costly here. Maine doesn’t mine coal, pump oil or drill for natural gas. Every dollar we pay for fossil fuels is a dollar drained from Maine’s economy. However, Maine does have huge untapped potential for offshore wind, tidal power, biofuels, and solar energy. Expanding the use of these alternatives will make Maine more economically independent and generate good jobs here. Peter Mills, a lifelong Republican, is executive director of the Maine Turnpike Authority and a former state senator from Somerset County. He was twice a candidate for governor in GOP primaries. Sharon S. Tisher, a lifelong Democrat, is a lecturer in the School of Economics and the Honors College at the University of Maine. She is a member of the Maine chapter of the national Scholars Strategy Network, which brings together scholars across the country to address public challenges and their policy implications. Members’ columns appear in the BDN every other week.